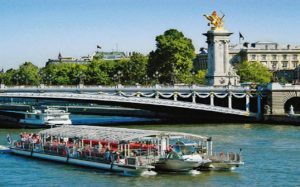 RIVER TOUR: See Paris From the Most Beautiful Boulevard in the City! GLASS COVERED CEILING: See Paris in Any Weather. ENJOY AMAZING VIEWS: Many Parisian Attractions. FAMILY FRIENDLY: Non-Stop Tour. See the Main Sites Without the Walking. AVOID LONG TICKET LINES: Go Directly To Boat, No Waiting. INFORMATIVE AUDIO WITH HEADPHONES: Listen in 13 Languages. FLEXIBLE: Departures Every 30 Minutes ( APR-SEPT ) or Every 1 hr ( OCT-MAR ). YOU DECIDE: Tickets are Valid For Any Day During Your Stay, Go When You Want! GREAT START LOCATION: Board Cruise Ship at Eiffel Tower. AVAILABLE TO ALL PARIS VISITORS + ALL COBBLESTONE GUEST. MINIMUM 2 DAYS ADVANCED BOOKING REQUIRED.